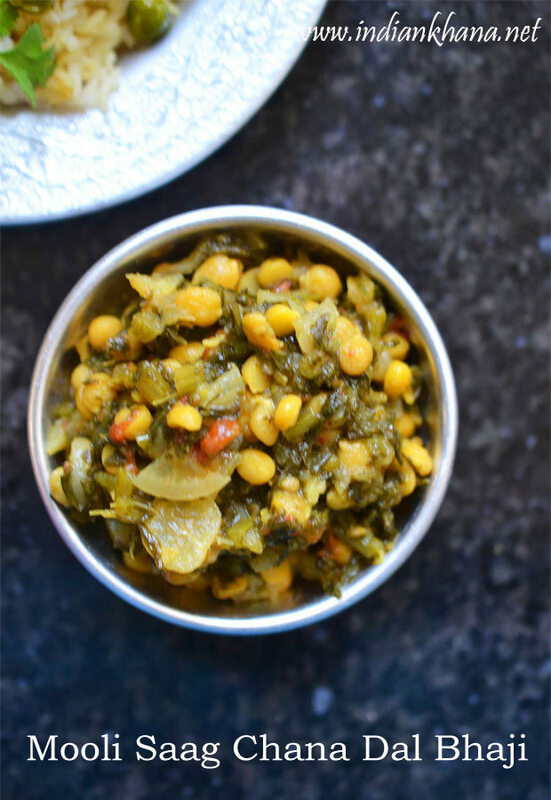 Lot of people throw the leaves that comes with radish, beetroot etc but then you should not specially if the leaves are really fresh, green so here is waht you do you make this simple side dish with chana dal which makes excellent winter recipe as chana dal provides heat to body. 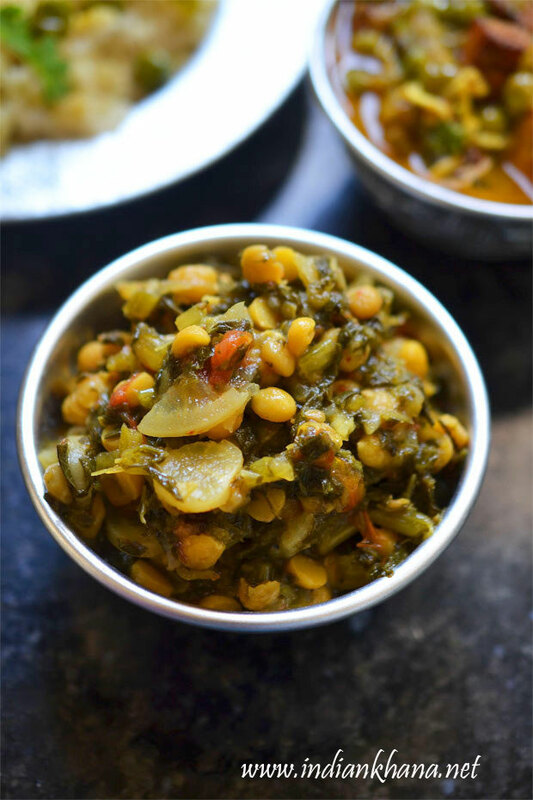 It's very easy with just few ingredients and we don't have to do much, just pressure cook everything and give a tadka and we have yummy side dish to relish. 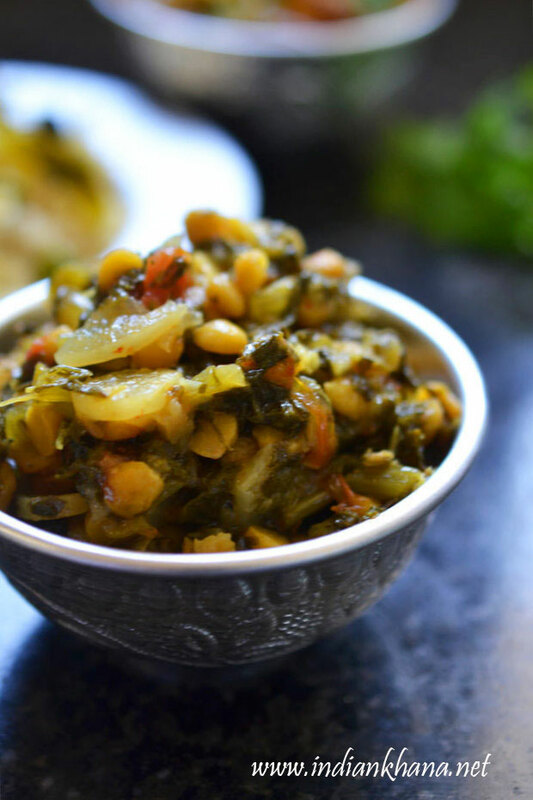 This mooli chana dal bhaji was made almost every 2nd day as every day radish was used for salad so the fresh leaves will go in making this bhaji which gets served with rice and another side dish along or some dal as this is more like kootu. This particular day it was made with plain pulao, matar paneer and yum a very good delicious meal. So now you don't have to throw any of your green and make this. There is also Mooli Chana Dal and Mooli Paratha I have posted. Winter special fresh radish leaves cooked with bengle gram. In pressure cooker add dal, radish pieces, radish leaves, tomato, green chili, turmeric powder with 2 to 3 cups and pressure cook for 2 whistles, we need chana dal to be cooked but not mashed as you see in pictures. 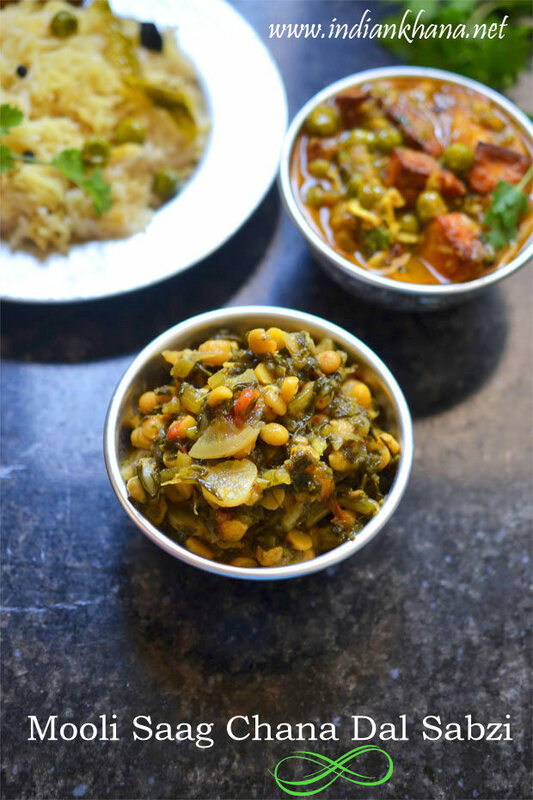 If chana dal gets mashed then it will be more like dal than sabzi. Once pressure released mix everything. In a pan or kadai heat oil or ghee, add cumin seeds, fenugreek leaves (methi), if using, garlic, broken dry red chili and saute until fenugreek leaves gets light brown. Add cooked dal with radish, salt and bring it to good boil, cook until all the water evaportes and it becomes like dry sabzi off flame. Add coriander leaves and mix well. Serve hot or warm with rice, paratha. Here we had with plain pulao, matar paneer. You can do the same with just radish instead of leaves. Make sure chana dal doesn't get mashed, for this add 2 or 2.5 cups water it will be enough. If you wish you can also add onion, saute and then add cooked chana dal, radish. 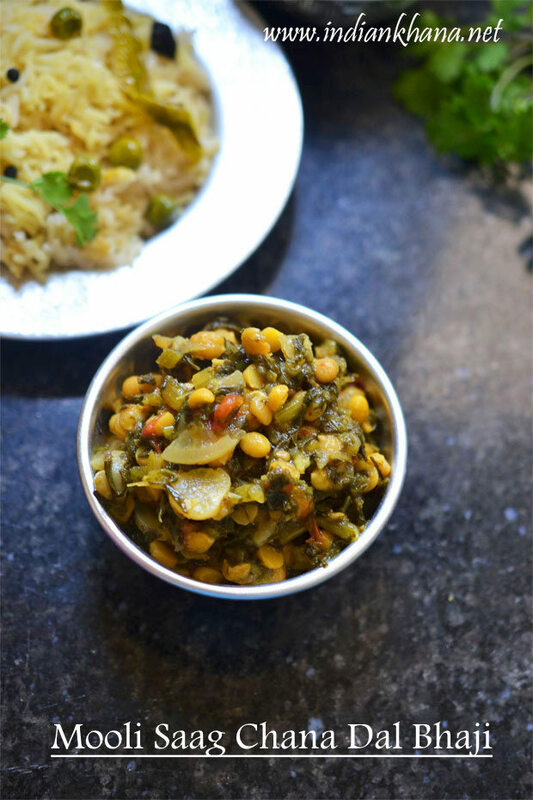 Healthy winter special Mooli Saag Chana Dal Bhaji.